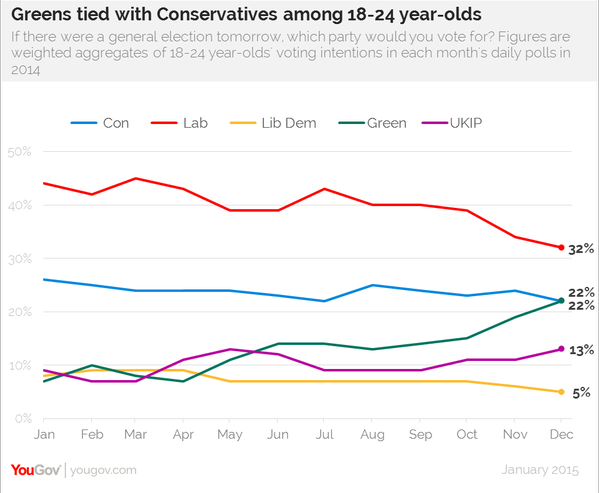 The Green Party of England and Wales have huge support among young voters. The problem for the Greens is that it is traditionally these young voters who do not make it to the ballot box. 22% of 18-24 year old voters recently told YouGov that they plan to vote for the Greens. That is the same figure as those who intend to vote Tory, 50% more than those who intend to vote UKIP and more than four times those who plan to vote Lib Dem. The obvious problem for the Green Party is that these voters, who they are so popular among, are also traditionally the ones who fail to make it to the ballot box on polling day. Indeed in the 2010 General Election less than half of young voters eligible to vote took up the opportunity. One poll suggested that 60% of the UK’s 3.3 million first time voters in 2105 will not vote. In contrast, about 70% of over 65s will vote. If young people voted in similar proportions to the older generations our political landscape would look very different to the tired two-party-politics we see today. The fact that young people don’t vote in large numbers is depressing not just for Green Party activists but also for our democracy in general. From this I take a simple message. If you are looking for a pragmatic, realistic and effective way of revolutionizing how we do politics in the UK, you could find worse ideas than supporting initiatives that encourage youth engagement. There are various movements and campaigns around but the one that seems to making the difference this time around is ‘Bite the Ballot‘. They have done an online Q and A with each of the party leaders (you can watch them here), placed young people in the heart of our local government, and pushed for wide-spread voter registration. In short, I think they are doing important work at an important time. If you want, you can follow ‘Bite the Ballot’ on twitter by clicking here. You can also donate to their work by clicking here. Supporting initiatives like these should draw cross-party support. Greens and Labour might have the most to gain tactically from better democratic engagement with young people, but ultimately we will all benefit from a healthier democracy.